The Fremont Street Experience is located Downtown Las Vegas, Nevada. Located on Fremont Street between Las Vegas Boulevard and Main Street, the Experience is comprised of a large mall as well as a string of attractions for both tourists and locals alike. You know you’ve reached it once you see a barrel vault canopy that’s four blocks long. The Fremont Street Experience offers a range of activities, restaurants, and attractions for visitors of all ages. Click to book your Big Bus Tours. While the majority of the action in Las Vegas occurs on the famous Strip, the rest of it is happening on the Fremont Street Experience, which is considered Old Vegas because it is here that most of the major players in town got their start. With five square blocks of outdoor shopping, restaurants, and attractions there is always something to do and fun for the whole family to be had. There are a couple of the main attractions that visitors should be focused on which we will list individually below. Click to book your Big Bus Tours. First up, the Viva Vision LED display is a must-visit for tourists new to the area. It’s a massive LED display that offers high-tech light shows ran through the Viva Vision Screen. The screen has a 550,000-watt speaker and features over 12.5 million LED lights. Next, the SlotZilla zip line offers an outdoor ride that can be fun for the whole family. This slot machine-inspired zip line attraction stretches two different routes that range between 77 and 114 feet. Guests will be able to look down on the Fremont Street Experience from above as they sweep through the air. Finally, we suggest heading to the Neon Museum which opened in 1996 in order to take a close up look at Old Vegas. It’s a non-profit museum that collects and preserves pieces of local history, for educational, historical, arts and cultural enrichment. There are guided tours, photo shoots and event bookings available, and guests should slot in at least two hours to enjoy everything on display. A night out on the town doesn't have to exclude a high quality meal around the Fremont Street Experience. It’s comprised of five square blocks of entertainment and a large selection of places to dine out, suitable for different needs and price points. The Triple 7 Restaurant & Brewery, located on North Main Street, is one of the most popular semi-casual dining options on the FSE. It offers high-end craft beers and easy-to-eat comfort food set within a microbrewery layout. Higher end diners will want to take a trip to the Redwood Steakhouse right down the street. The Redwood Steakhouse is closed on Wednesday and Thursday but otherwise offers some of the finest steak dishes in the neighborhood. Finally, the California Noodle House is a popular destination for casual eaters who want high quality Asian fusion food on a budget, especially for their Korean tacos. 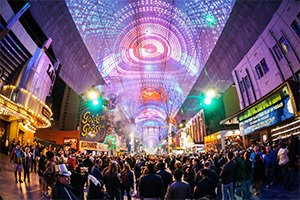 What makes the Fremont Street Experience a true attraction for visitors all over the world is the collection of events that happen all around the year. There are a few events that guests should try to visit in time for. New Year's Eve at the pedestrian mall is a revelatory experience thanks to the the Viva Vision light show and the wide range of dining options available. There are also permanent outdoor stages with bands and live entertainment all year round. So no matter what time of year guests visit the Fremont Street Experience they will be able to catch a light show and free live music. 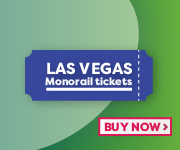 Click here to visit Fremont Street Experience official website.